A new world of mixed reality is emerging and Sita Lab, the research arm of air transport IT provider Sita, is exploring its potential for airlines and airports. Sita released early results of research carried out with Helsinki Airport using Microsoft HoloLens to analyse and manage airport operations in a mixed reality environment. HoloLens is the world's first self-contained holographic computer, enabling users to engage with digital content and interact with holograms in the world around them. It runs Windows 10, and enables the blending of the physical and digital worlds in ways that were previously impossible. 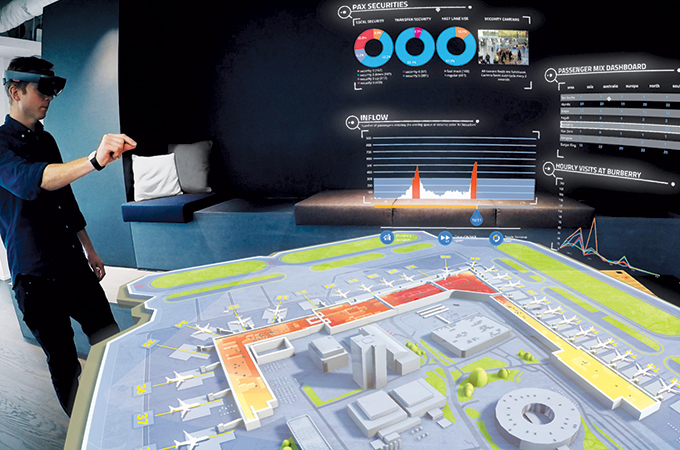 Sita worked with Helsinki Airport to use HoloLens to reproduce the airport operational control centre (AOCC) in this mixed reality environment. For this project Sita Lab used a feed from Sita’s Day of Operations technology, which is used by Helsinki Airport, and presented a new way to visualize and interact with the airport’s operational data including aircraft movement, passenger movement and retail analytics. Wearing the HoloLens, the operators had a set of screens meshed into a 3D view of the airport allowing them to correlate events from the data dashboards with an immersive real-time model of the airport. This new way of looking at the world can provide new insights into how the airport is functioning. HoloLens also opens the possibility of being able to access the AOCC environment from any location, on or offsite, allowing experts to provide input to situations remotely. Mixed reality, which combines augmented and virtual reality, is more than a new interface, it is a new way of looking at the world and allows things to be done in a new way. It enables digital and physical data to exist together. Research shows that there are potential uses for airlines and airports – for operations, maintenance and training and take innovation beyond the screen. While the technology shows potential, Sita Lab points out it is early days and before enterprise use at airports issues of weight, size and durability will need to be addressed. Users must also learn how to interact in this new environment to maximise its benefits.